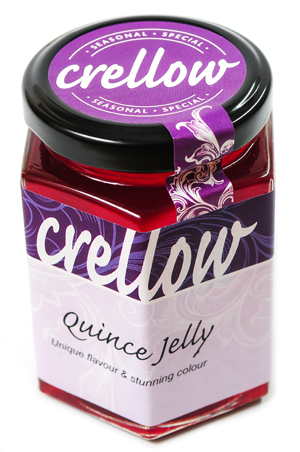 Producers of a wide range of preserves, chutneys and condiments under three distinct labels: Sisley’s; Crellow and Amelia Rose. Apricot Preserve: A very versatile preserve, making a good “glaze” for desserts. ‘Soft set’, it is chunky but spreadable. Dark amber colour. Blackberry and Apple Preserve: Deep dark purple, with some seeds. Great as a filler for sandwiches or cakes and a good sauce for ice-cream. Blackcurrant Preserve: Very dark and smooth. Good on toast, with scones and clotted cream or in tarts. Gooseberry and Orange Preserve: ‘Taste Of The West’ 2015 Silver winner. This tangy yet sweet amber coloured preserve is like summer in a jar, packed full of juicy gooseberries and citrus zest. A beautiful alternative to Strawberry preserve as part of a cream tea, or as a Victoria Sponge filling. Marrow and Ginger Preserve: Made with local marrows and crystallized ginger this has a lovely bright yellow in colour and a chunky texture. Good on wholemeal toast and also goes well with soft cheeses. Plum Preserve: Red/brown in colour and ‘soft set’ so fairly loose in texture. Easily spreadable. 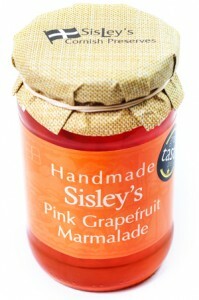 A good alternative to strawberry jam for cakes and tarts. Raspberry Preserve: A dark pink, glossy jam with seeds. Great for cake fillings, cream teas, or with waffles and pancakes. Rhubarb and Ginger Preserve: Pink/brown in colour with a “soft set” and loose texture. Great swirled into natural yoghurt and lovely with porridge. Strawberry Preserve: . The strawberries are lightly mashed to create a textured, but spreadable dark red jam. Orange and Ginger Marmalade: Made from sweet oranges and crystallized ginger, this is of mid orange colour, chunky texture and thick cut peel. Great in homemade orange and ginger cake. 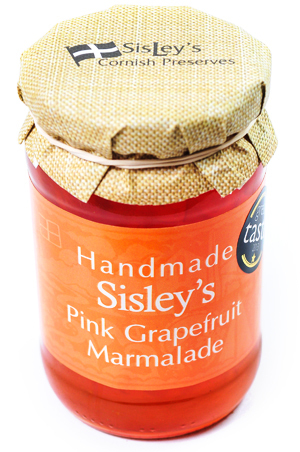 Pink Grapefruit Marmalade: Sharp and tangy with a lovely pink/orange glossy colour. Perfect for breakfast time on toast, muffins or crumpets. Seville Orange Marmalade: A dark orange glossy colour with lots of peel and a bitter taste. Great on toast, cakes and crumpets and a really good glaze for pork. Three Fruit Marmalade: Made from sweet oranges, lemons and pink grapefruit this marmalade has a thick cut peel and is of mid orange colour. Apricot and Date Chutney: Orange/brown with a chunky texture and particularly good with cold meats or in sandwiches. Banana Chutney: A caramel brown chutney with a thick consistency, it’s particularly good with curries. Christmas Chutney: A gently spiced apple and lemon based chutney, embellished with seasonal cranberries and dried fruit. A perfect partner for a cold cuts/cheese platter and an excellent way to cheer up some left-over turkey. 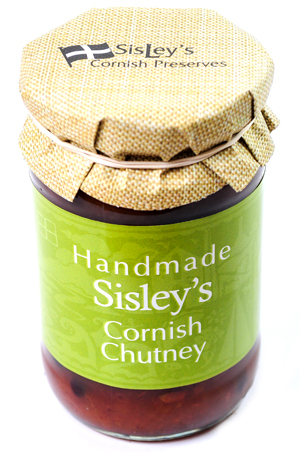 Cornish Chutney: Sisley’s most popular chutney is made from apples, onions, Cornish Tribute ale, malt vinegar and dried fruit and spices. Caramel brown in colour with a loose spreadable texture, it is great in sandwiches, baguettes or rolls as part of a Ploughman’s Lunch. Hot Apple Chutney: Made with apples, onions, dried fruit, malt vinegar sugar & hot spices, it is dark yellow/brown in colour with a loose spreadable texture. Good with pork & other cold meats. Piccalilli: Made with cauliflower, cucumbers, green beans, onions and spices. Bright yellow and with a chunky texture it’s great with cold meats and sausages. Plum Chutney: Brown/purple in colour. Very good with pork, cold cuts and pies. Red Onion and Chilli Delight : A moreish relish with a background hint of ginger and garlic. Delicious with cheese and crackers, savoury tarts, toasted sandwiches or with meat from the barbecue. Red Tomato Chutney: Made from tomatoes, onions and apple, the chutney is red/brown with a loose texture and is excellent with cheese and ham. Traditional Apple Chutney: Made with apples, pears, dried fruit and onions it has a smooth texture and dark brown glossy colour. Good with mature cheese and in sandwiches. Blackberry Vinegar: A wonderful base for a salad dressing made with blackberries and white wine vinegar. Chilli & Garlic Vinegar:Created from Bird’s Eye chillis and garlic cloves, this light yellow vinegar is great for salad dressings and stir fries. 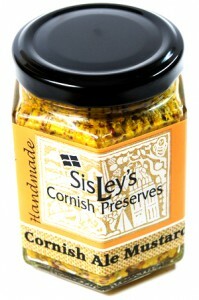 Cornish Ale Mustard: A fairly hot mustard made with brown and yellow mustard seeds and Cornish Tribute ale. Pink Peppercorn Mustard: Fairly mild with a wholegrain texture, made with brown and yellow mustard seeds, pink peppercorns and tarragon. Raspberry Vinegar: Good for salad dressings. Spiced Cranberry & Orange Sauce: Jewel like in colour, this tart, yet sweet condiment is a winner. No Christmas dinner is complete without a jar of this on the table! A chunky style sauce full of festive flavour & warming cinnamon. Thai Chilli Dipping Sauce: Made with chillis, ginger and garlic this dark red sauce has a glossy, sticky consistency and features chilli seeds. It is great with chicken or prawns as a sauce on the side, is a good marinade for meat, or try adding a splash to stir fries. Apple and Onion: Bramleys, chopped onion, sultanas, lemons, malt vinegar sugar. Light brown colour. Versatile uses, including sandwiches, cold cuts: good with mature cheddar and great with pork. Apple Apricot and Cider Jam: Made with Bramley apples, sugar & dried apricots that have been soaked in cider. Amber/orange in colour with chunks of apricot. Good on toast, as a cake filler, in porridge, in yoghurt, or as a sauce for ice cream. Apple Date and Ginger Chutney: Bramleys, dates, root ginger, garlic, cider vinegar, sugar. Light brown, thick consistency, sweet taste. Great with cold cuts, especially pork. Beetroot Relish: Local beetroot, malt vinegar, onions, sugar, spices. Beautiful deep purple colour, chunky texture. Award winner. Good with smoked salmon & crème fraiche.Great with cheese and crackers and in toasties with mature cheddar. Berry Sublime: Inspired by the flavours of a well known summer beverage, this jam is packed full of seasonal berries, with a hint of mint, and cucumber. Unusual and refreshing, this preserve would make a lovely tart or sponge filling and is heavenly when paired with clotted cream. Chutty Chutty Bang Bang: An Indian ‘Bengali’ style chutney with apples, ginger, dried fruit, malt vinegar, sugar & fresh chillies. Dark yellow/brown in colour and chunky texture.Great in sandwiches/baguettes, with sausages, cold cuts and, of course, with a curry. Crab Apple Jelly: A popular jelly due to its irresistible colour & unusual flavour, this seasonal product is great with roast pork, but equally good with hard cheese. Damson Jam: Pretty much the same as Kea Plum Jam, apart from the plums coming from outside Cornwall. Damson & Rosemary Jelly: Dark purple, plum based jelly, with freshly chopped rosemary. It has a deep sweet flavour and is perfect for rich meats such as lamb or beef or game. Damsons in Distress: Made with small hedgerow plums (damsons) onions, dried fruit, vinegar, sugar and spices. Quite sharp, good for cutting through fatty meats such as duck. Dark purple/brown chutney with a thickish texture. Better suited to meats rather than cheese. Fathers Favourite Chutney: Thick, chunky dark chutney full of dried fruits, apples, tomatoes, vinegar, sugar and spices. Goes well with ham/cheese in sandwiches or as part of a cheese board. Fathers Favourite Marmalade: Made with bitter Seville oranges and sweet oranges, this is a thick cut, tangy and fresh marmalade, dark glossy amber in colour. It is a perfect pick me up for breakfast and is excellent on buttered crumpets and toasted muffins. Hot Goddess: Highly spiced apple chutney with hot birds-eye chillis, onion sugar & cider vinegar. Dark yellow/light brown very loose & spreadable.Great with pork, with a curry, in sandwiches etc. 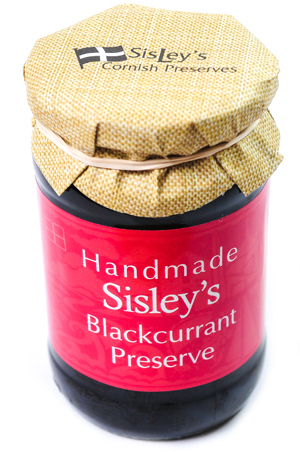 Jewel In The Crown: Indian mixed fruit chutney, dark glossy brown, sticky and chunky. Includes mango, chilli sugar and ginger. Sweet and versatile, it is ideal for a curry, and suited to all cold meats. Kea Plum Jam: Made with sugar & local damsons that are known as ‘Kea Plums’ from the Parish of Kea and Coombe near Truro. Dark purple in colour and fairly smooth consistency, sharp yet sweet and almost floral in flavour. Very popular with locals. Lovely alternative filling for a Victoria sponge, great with scones or in tarts. Mint Jelly: Apple based with sugar & freshly chopped mint. It is a sweet, pinkish red transparent jelly with mint suspended throughout. Perfect with roast lamb, brushed onto grilled lamb chops, on barbecued meat, or on new potatoes. Old Dowerhouse Chutney: Made with Victoria Plums, tomatoes, dried fruit, vinegar sugar and spices. It is mid brown in colour, and chunky but spreadable. Good with ham, in sandwiches or with a meat/cheese platter. Onion Relish: Sliced white & red onion, mustard seeds, chilli, cider vinegar, sugar & lime juice/zest. Light brown colour and chunky texture. Brilliant for burgers, sausages, other barbecue items, sandwiches, cheese and crackers, and toasties. It is also nice when added to gravy for roast meats. Orchard Chutney: Cooking apples, pears and apricots, with vinegar sugar and spices. Light brown colour, it is textured, but spreadable. Brilliant with a cheeseboard. Quince Charming: Chunks of quince suspended in a jelly made from quince/lemon juice & sugar. A lovely deep pink/red/brown colour it is similar in texture to tinned pears Nice with cheese or as part of a pudding/dessert. Quince Jelly: Quince based, with sugar and lemons. Very sweet , with an unusual floral scent and flavour. A beautiful transparent pink, it has similar uses to jam, but also compliments cheese. Red Pepper Relish: Chopped chunky red peppers, red onion, white wine vinegar, spices and sugar. A bright red and brown colour with a chunky consistency, this relish is deal for hot dogs, burgers, steak, toasted cheese sandwiches, or cheese and crackers. Rhubarb & Grapefruit Marmalade: Rhubarb, soaked in pink grapefruit juice & zest, then cooked with sugar to produce a Light pink/brown marmalade with a loose texture. Great on sponge cakes, on crumpets, toasted muffins, or swirled into Greek yoghurt. Rosemary Jelly: Apple based with fresh chopped rosemary suspended throughout. It is a reddish transparent jelly, perfect with roast pork or lamb, or melted over new potatoes. Brush over chops under the grill. Summer Marmalade: Very similar to “Father’s Favourite” marmalade but with sweet rather than Seville oranges. Sweet Pickled Cucumber: Quite an ‘old fashioned’ recipe which is known to the older generation as ‘bread and butter pickles’. Slices of cucumbers and white onions are potted with hot, spiced vinegar/sugar solution and sliced chillies and mustard seeds added. Similar taste to pickled gherkins.Brilliant with burgers and other grilled meats. Lovely with cheese and crackers. Tom Foolery: Tomato onion and red pepper based, with lime, vinegar, dried fruits, root ginger, sugar and spices. Dark red, fairly thick. Brilliant for burgers, sausages, other barbecue items, sandwiches, cheese and crackers, and toasties. Apricot with Amaretto Preserve: Chopped apricots, sugar, amaretto (Italian almond) liqueur, lemon juice. Amber colour, soft set. Great with ice cream or yogurt, porridge, toast, croissants. Orange with Whiskey Marmalade: Made with sweet oranges, lemons, sugar and whisky. Chunky texture, mid orange colour. Great on toast, on crumpets or on toasted muffins. Plum with Rum: Plums, sugar, dark Caribbean rum. Dark purple in colour and soft set. Good cake filler, scone topper, swirled into yogurt. Raspberries with Kirsh: Raspberries, sugar, lemon juice, kirsch (cherry) liqueur. Dark pink glossy colour, with fruit seeds. Lovely with croissants, in yogurt, cream teas, sauce for deserts. Strawberries and Champagne: Strawberries, sugar, pectin, champagne. Strawberries are soaked in champagne before cooking. Smooth texture ,mid to dark red colour. Delicious on a croissant or crumpet. Good cake filling and can be used as a sauce for deserts.